Very pretty Lynn. Love the contrast of the red hearts on the white paper and the velum and cutout sentiment just bring it all together. Great card! This card is lovely. I have the falling stars, but not the hearts. I think after viewing your beautiful card it will become one of those items that I really NEED. Those little sequins give your card such a special touch. I, too, have more vellum than any human on this earth should have. When I first started scrapbooking I used it so much that after a few years I put it all in the back of the closet so as not to see it for a long time. Maybe I should dig some out now. Have yourself a marvelous day, Lynn. It is snowing right now here. Getting 3-6 inches this morning and then sleet and rain. Going to be a big mess. Love, love your card and I especially like the pink vellum with the red! Great card! That bright red embossing paste has come in very handy, Lynn. How pretty will all the red hearts. I like your pink vellum, too. I'm not tired of seeing Valentine cards yet. Expecially when they look as pretty as yours. I definitely would have bought that red embossing paste. (I like to use stencills.) Makes me feel sad when I hear about yet another stamping store going out of business. Elegant simplicity. CAS is my prefered. The more complicated the harder to make it easy to get into. Nailed it Lynn. Great card and love the red embossing paste. I've been playing around with embossing paste lately too and it's so much fun. Love the pink vellum too. Loving all those hearts... and the sequins! I'm done with my Valentine cards but this one just inspired me, Lynn! I glad to know that was done with a stencil and that you didn't have to spend the time to do it all freehand. I think it's exquisite and I love the pink vellum. Beautiful, my friend. This is beautiful Lynn, love the gorgeous hearts and the vellum. This die makes such a pretty card! Love that vellum tag! LOVE the hearts and vellum... so pretty! I love this Lynn, its beautiful!! I just love all those falling hearts! They're so delicate and fragile looking but make for one fantastic card! The vellum panel & sentiment just works perfectly with those tiny sequins! NJ! Ya, I am tired of Valentines, and I have not created many. This is beautiful, I just love all the hearts. Beautiful card Lynn...love the addition of the pretty vellum...I think we are all alike that we have way too much of everything, but does that stop us from buying...heck no, and I just sent in an order yesterday for what I can't even remember, that tells you I really needed it...heck if they put it out there we will buy it...lol!! so when Valentines is over, what is next?? Fabulous use of the stencil and I love the bright red against the white background. A lovely way to use the vellum too even if it didn't use much out of your vellum mountain! Love this sweet, sweet Valentine, Lynn! Great card...I love it! Nice to hear someone else express their holiday burnout. I'm not the only one! What a great card, Lynn! I totally love how you used the hearts and sentiment! You are hilarious, Lynn! It's a good thing that red paste and pink vellum came in handy for this card 'cause they look amazing together. Thanks so much for playing along with the Simon Says Stamp Wednesday Challenge: Have a Heart! This is beautiful Lynn, I love all of the hearts and that fabulous love die cut! 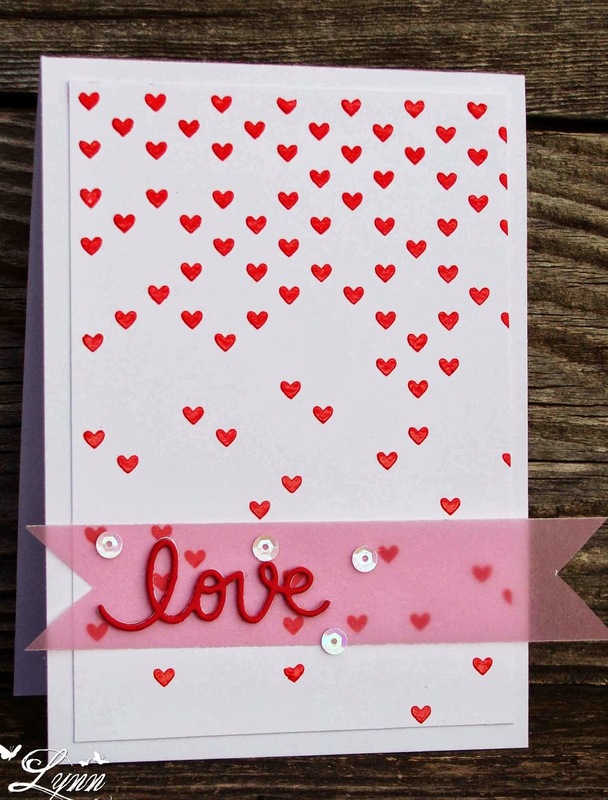 Who could be getting tired of valentine cards when here you create a stunning one. Love the cascading hearts, and fun lettering. Super cute, super sweet and stunning Lynn. Oh yes, that feeling. "But I'm not coming back, and it's on sale, and ooooh, ok." lol Love the vellum poking over the edge! How elegant! I really like every detail, including the love die cut and those sequins too! Beautiful. Love all those hearts. How wonderful is this card! Love the hearts with paste- and you did a fab job with it too! Love the vellum- awesome touch! So sweet, simple and fresh. There is a lot of romance coming from him and he makes me smile. I think you made a wise investment in the red paste! It looks fantastic on your wonderful card! I almost spit coffee on the screen when I read your 'live to be 180' remark! No wonder we found each other in blogland-kindred spirits! !